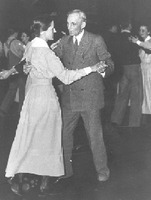 Photo of Henry Ford dancing with Berry student. Miss Clara L. Snow informs Martha Berry that she should be receiving a box of old clothes soon. She also sends a check for $150 for a scholarship and reports on Mr. and Mrs. Ford, dancing, and a new automobile. 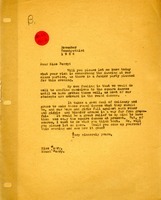 The writer asks for Berry's decision about dancing at class parties, as there will be a Junior class party that evening. The writer recommends confining dancing to square dances. The students are awkward in round dances, falling against each other and blundering around in an ungraceful manner.